Everything in the world can be on your way – These Two Eyes! I’ve always been envious of those who have literally traveled around the world. You too likely know someone daring who’s done it. They buy a ‘round the world’ ticket that entitles them to travel to a pre-specified number of continents, then a specific city on each continent, to be used in one direction over a maximum length of time. This type of ticket offers freedom to those people who have time at a very affordable cost. The benefits to an independent traveler mean that they can ‘generally’ stay for as long as they like, move on when ready, and can decide when and how to make the most of their destinations. Last month I circumvented the globe. I can assume this counts too, but it wasn’t your typical trip or initially intended to be as such. I reclaimed my old haunts while in London, sipped wine in Paris, explored architecture in Oxford before a 12 hour stint in NYC to grab a pint and a snuggle with old friends. I moved on to Charlotte to celebrate my sisters wedding then relaxed on the beaches outside of Charleston before an afternoon of fine dining over lunch with the ladies back in Manhattan. My long hauls took me from Melbourne to London (via Dubai) to New York then back to Melbourne (via LA) and alas, global circumference. Australia really is really, really far away. But it’s not the distance I took note of, by now I’m used to the flight time. What was more interesting is that for the first time since living here for close to 3.5 years the segregation of Australia to the rest of the world became prevalent. I was clueless that I missed out on major global media scandals, was reminded of diversity walking through the streets of New York and how few Americans I encounter living in Australia compared to the constant sound of a hard ‘R’’ that accompanies the American tourists in central London. Don’t let jetlag control you; jetlag will control you. Despite a motto of ‘just ignore it and it will go away’, jetlag really is the pits. And whilst I was in and out of cities faster than being able to unpack a bag, there was no time to waste on an extra nap or late sleep in. Once you throw a few wines into the mix your body clock is even more thoroughly confused. If you can ride the jetlag wave, all power to you. Frequent Flyer Status is holy. In a world where I’ve achieved One World Gold status, which entitles me to the business lounge, free food and alcohol, free Wi-Fi, priority check in, priority baggage and occasional upgrades, flying a non-partner airline is like going back in time. The disappointment, as self-entitled as it may sound, to have to pay for wi-fi while waiting to board a flight or annoyingly wait in a ridiculously long and disorderly queue makes me cringe at the thought. I can at least say I witnessed non-Gold perks during all the flights it took to obtain it in the first place. Waiting to write drains the intensity. I have pages and pages of notes from my trip encapsulating the emotion I felt when stepping outside Victoria Station for the first time in 8 years to seeing my nephew for the first time in 8 months. Unfortunately, there’s too much to say and sometimes it feels all too late. Next time, I’m writing to you on the go. The world really is a small place, and quite accessible if you make the opportunity to see it all! It is possible to fly around the world – even if you’re not on a yearlong journey with a backpack strapped to your back. And while I’m still envious of those who take an extensive amount of time off to discover the world in one pre-paid for direction, I’ve also discovered that hopping over to London before my trips to New York, or maybe somewhere else in Europe is quite do-able. I don’t need to wait another 8 years to see the places I love. 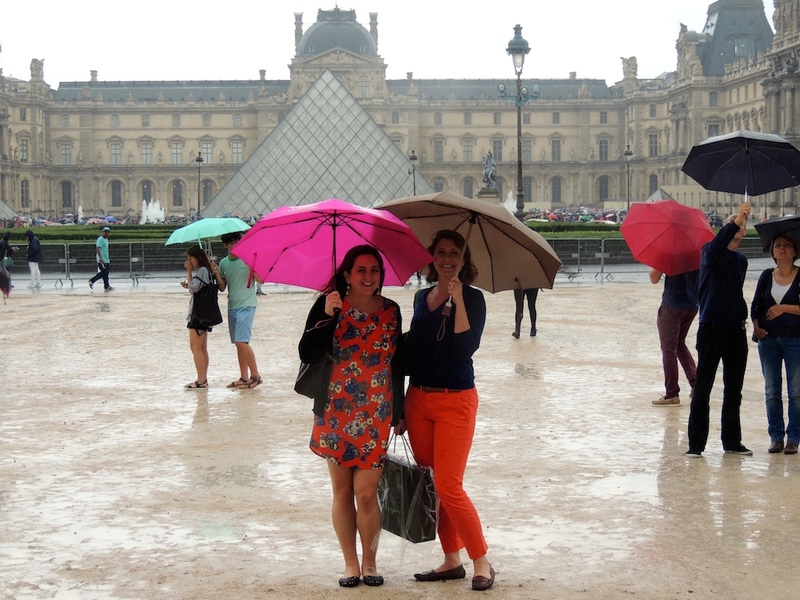 Catching up with an old friend in the rain outside the Louvre, Paris. As always, I see the world through the eyes of my daughter….exciting, descriptive and always inciting a yearning in me to give it a try…. Hop on a flight and go see the daughter I miss so much. You are the one person I know who lives life to the fullest. May that never change, no matter where you go. So glad you’re back safe n sound. Enjoy! Hi Emma, thanks so much for reading, and for your feedback! I’m American and have lived in both Australia and England, both beautiful countries. I’m sure you’ll be back one day!